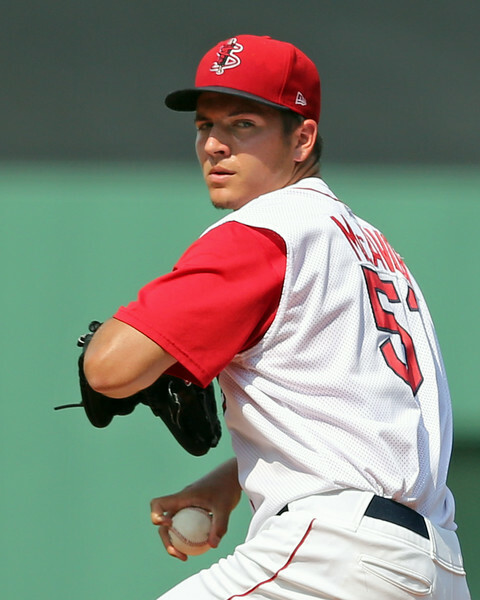 FORT MYERS, Fla. -- When Kevin McAvoy was selected in the fourth round of the 2014 draft by the Red Sox, it came as a bit of a surprise. That, in large part, might have been due to the fact that draft followers were not used to seeing players from Bryant University selected that high. In fact, he was the highest MLB draft pick in the Rhode Island school’s history, a distinction he takes great pride in, but that he would not mind losing in the near future, as he discusses below. 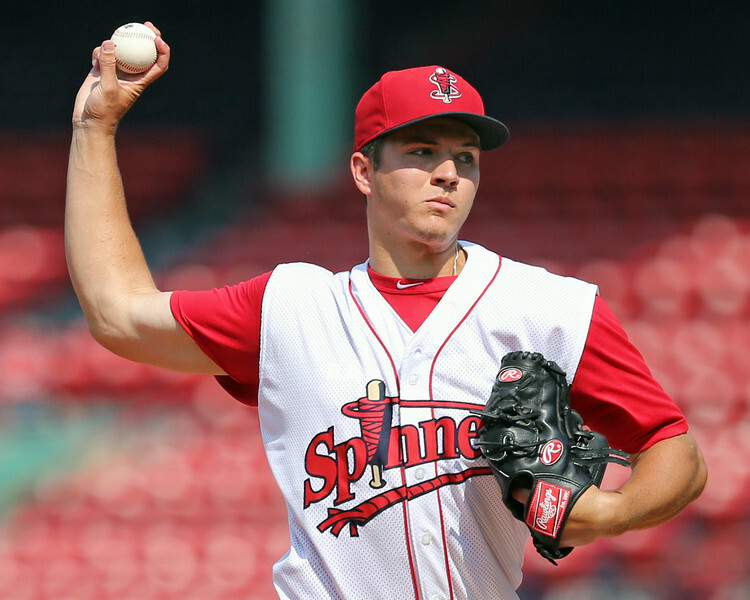 Last season, McAvoy jumped straight from a short stint in Lowell after being drafted up to Salem, foregoing Greenville entirely. While some of the numbers generally used to assess pitching prospects were not great (5.2 K/9 and 4.5 BB/9), his greatest asset is his ground ball-inducing sinkerball and, in that realm, he succeeded. Of pitchers with more than 60 innings in the Red Sox minor league system last season, he had the highest groundout-to-flyout ratio and also induced the most double plays by a wide margin with 25. The next highest in the system were two tied at 18. Coming off of college and short-season ball where the routines are quite different, it’s also extremely impressive that he was third in the system with 141 innings pitched, just a few innings less than the overall leader. Overall, he made 26 starts in Salem, finishing with a 3.89 ERA and 1.47 WHIP. This year, the 22-year-old looks likely to begin the season in the Portland rotation. McAvoy took some time to answer a few questions earlier in spring training. Matt Huegel: How did you end up choosing to go to Bryant? It’s not exactly known as a baseball hotbed, so to speak. Kevin McAvoy: I didn’t have a lot of offers out of high school. I was a late bloomer, and the head coach at Bryant (Steve Owens) was at Le Moyne University in Syracuse, so I grew up in high school knowing him. He headed over to Bryant my junior year, and he told me to take a look at it. And they started to build a pretty good program, we’ve had 15 guys in pro ball in the past three years. So the numbers are starting to get there, and he’s a really good recruiter. We have a couple guys there now who are going to be very good. MH: Yeah, the year you were drafted there were four or five other drafted. I think that was the highest total ever? MH: And the couple years before you, there were a few guys drafted. Was that fun having that group come up together? KM: Yeah, it was. And everyone was working towards that same goal. So even the guys that weren’t as highly-regarded prospects, they saw us with that drive, and it pushed everyone to work hard, which I think definitely helped out the team a lot and the success was there. MH: So mainly it's the coach and recruiting that is building the Bryant program? KM: Yeah, it’s not easy to build a program in the Northeast, especially when you know that you’re not going to be outside until the first game down south. But he's done a great job with it. MH: You said you were a late bloomer, when did you realize that some scouts were watching you and it might be an option to go professional? KM: Probably my senior year of high school. That's when my velocity seemed to tick up a little bit. MH: When do you feel like you broke out in college? KM: I’d say my freshman year. Then I struggled my sophomore year, and then my junior year, I picked up some things from failing my sophomore year that really helped me improve. MH: Were you noticing a lot of scouts at your games by your junior year? KM: Yeah, definitely. We always had all the northeast scouts following our team around a little bit, but yeah, there was definitely more. MH: What was the draft experience like for you? It seemed like a bit of a surprise pick, maybe a little higher than people thought? KM: Yeah, one of the Tampa Bay Rays’ scouts was my travel coach in high school, and he sat down with a couple of us that fall, and said, ‘You know, you got to be realistic.’ He said, ‘If you have unrealistic expectations for the draft, you're going to be upset.’ So I talked to my agent a couple weeks before the draft, we sat down and he said, ‘If we go top 10 rounds and sign for slot, that's awesome.’ That's what we wanted. After that, we'll figure it out, but if we go top ten, that's perfect. The Red Sox called and said, ‘We're ready [to take you].’ We were like, ‘hey, alright.’ (laugh) That experience for me, learning to, not lower expectations, but be realistic, made it a much better experience than it could have been if that makes sense. So it's definitely worked out well. MH: Did you have a lot of pre-draft contact with the Red Sox? Were you expecting them to pick you? KM: I’ve known [Northeast, Canadian Crosschecker] Ray [Fagnant] since my freshman summer, he was on me. He's an awesome guy. So it wasn't like it was a surprise. He'd been around me for a bit and seen me throw some good games. It wasn't a shock. MH: Coming from the Northeast, it’s tougher to get scouts and your games and that sort of thing. Did you notice a bias against Northeast players? KM: Yeah, if you’re in the Northeast, it's not as true because it's [the regional scouts’] job to cover that area. But when we’re headed down south, they’re not [paying us much attention]. A southern scout’s not going to come to a Bryant University game most likely. MH: How does that feel to represent your college as the highest pick ever? KM: It's cool. (chuckle) Yeah, I'm hoping that my buddy breaks it next year. He's having a good year right now as a sophomore. KM: James Karinchak. He's a sophomore, low-90s guy. He already broke the strikeout single-game record this year. He's throwing pretty well. Over 10 strikeouts per nine right now as a starter. MH: As a sinkerballer, do you have any pitchers you model yourself after or watch for tips? KM: Derek Lowe. He's not playing anymore obviously, but he's a guy that pitches with some deception and works the sinker-changeup. Because there are guys like Roy Halladay that cut it, and they rely on that to a righty getting away from him. Where I'm trying to work more up and down to a righty. MH: Have you gotten to talk to Lowe yet? MH: You jumped straight from Lowell to Salem to start last season. Did you notice how big of a jump that was at first? KM: Yeah. It was good for the Red Sox to feel they could do that with me. So it gave me some confidence. But there was definitely an adjustment with the hitters from Lowell to Salem. There was an adjustment with the strike zone, the routine—because in Lowell I wasn't throwing real starts, it was two to three innings to get comfortable. Then I jumped right into six-, seven-inning starts, five-day routine, soreness, learning to recover. It was definitely a jump, but a good experience. MH: Speaking of the sinkerball, you had a really high groundball rate, but the strikeout rate was a bit low. Is that something you're looking to pick up this year? KM: Yeah, I would definitely like to improve. Get that strikeout rate up, and the walk rate down. But yeah, that's a big thing, and something I've talked about with people, if the ground balls are there, we can work with that. MH: You had the most double plays induced in the system, does that speak to the fact that a ground ball can be better than a strikeout? KM: Right, yeah... sometimes. With the walks being up too, it sounds great on paper with the double plays being high, but at the same time, that means there's guys on base. It was: guy on-ground ball; guy on-ground ball. MH: When you have guys on like that are you specifically working harder to get the ground ball? KM: Yeah, I learned that in college it's going to take three singles to score a run. That's a big thing that coaches preached to us. So if a guy hits a single, ‘hey, get a ground ball.’[If you get] another ground ball through the hole, get another one, two outs. MH: Were you getting tired by the end of last year in your first full season? KM: Probably in July. You hit that wall a little bit, and you have to pick it up. Take care of your body, work a little harder, and that's when you can really push through and get through August. MH: Yeah, it seemed like something kind of clicked for you near the end of July, was that anything specific? MH: Having the full season now, were you able to better prepare this offseason, knowing what to expect? KM: Yeah, definitely. Everyone's first season is a bit of a crap shoot. You start to learn your body, how it feels and what you have to do to get ready for a start, get ready for a day two bullpen and stuff like that. This spring training I feel a lot better than I did last spring. MH: Are you working on anything in particular so far this spring? KM: Repeating my delivery, staying consistent with my mechanics with my offspeed stuff. That's where I really had trouble; pulling a curveball away instead of up-down, pulling a changeup when I’m trying to stay up-down. MH: Are you expecting to begin the season in Portland? KM: I'd love to be able to get the chance to go to Portland, but if I head back to Salem, it's the same thing. You're still working, working on getting better. I trust the process so just trust it's going to be there, and keep working to get better.